Using Delphi 2010, we can build ASP.NET web services and projects, as I often demonstrate in my ASP.NET workshops and training events (in The Netherlands, UK and Sweden for example). In this article, I'll demonstrate how we can use Delphi Prism and ASP.NET to write a web chat service, consuming it in an ASP.NET web form as well. In order to participate with the demo of this month, you need a copy of Delphi Prism. After starting Delphi Prism, do File | New – Project, and in the Web node of the Delphi Prism project types, select the ASP.NET Web Application. Specify WebChat as name of the application. This will create a new solution with one project called WebChat. Inside the project, we’ll have a Default.aspx file (with associated Default.aspx.pas and Default.designer.pas), a Global.asax file (with associated Global.asax.pas), a Web.config file and a number of References. We’ll add the GUI controls to the Default.aspx file later, but let’s first add the Web Service engine to our chat service. 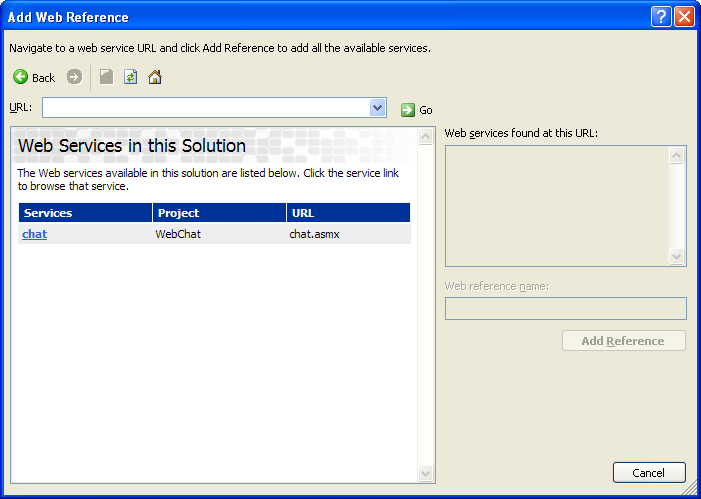 Right-click on the WebChat node in the Solution Explorer, and select Add | New Item. 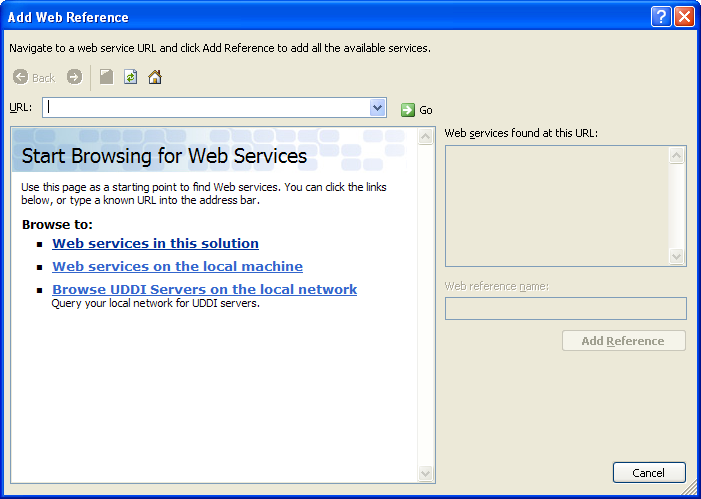 In the dialog that follows, select the Web node of the Oxygene categories, and pick the Web Service item. Set the name to chat.asmx and click on Add. This will generate a new file called chat.asmx with associated chat.asmx.pas. Unfortunately, inside the generated source code in file chat.asmx.pas the [WebMethod] attribute still appears above the implementation of the example method chat.HelloWorld instead of the definition of this method in the chat class. We need to move that attribute from the implementation to the definition. In fact, we don’t need the entire HelloWorld method at all, so feel free to remove both the definition and implementation. For the chatroom example, I need two methods: one to send a chat message, and another to retrieve all chat messages. The purpose of the constructor is to fill the Time, User and Message fields of the ChatMessage, so we can quickly construct the ChatMessage and put it in a dynamic list of chat messages. We will use the Application[key] as storage room for the collection of chat messages. A convenient container is the ArrayList, which supports an Add method to add a new ChatMessage, as well as an enumerator to walk through the list of chat messages again. The main question for the SendMessage method is whether the application[key] already holds an ArrayList with one or more ChatMessages. Note that I’m calling the GetEnumerator method of the ArrayList (retrieved from the Application[key]) and then use the MoveNext and Current methods of the enumerator to iterate through the chat messages. The implementation of the GetMessages method is extended with a Start parameter of type DateTime. We can use this value to compare the Time of the ChatMessage in order to select only the chat messages that are more recent. This concludes the implementation of the web chat service - without any security, yet (that will be a story for another day - stay tuned). 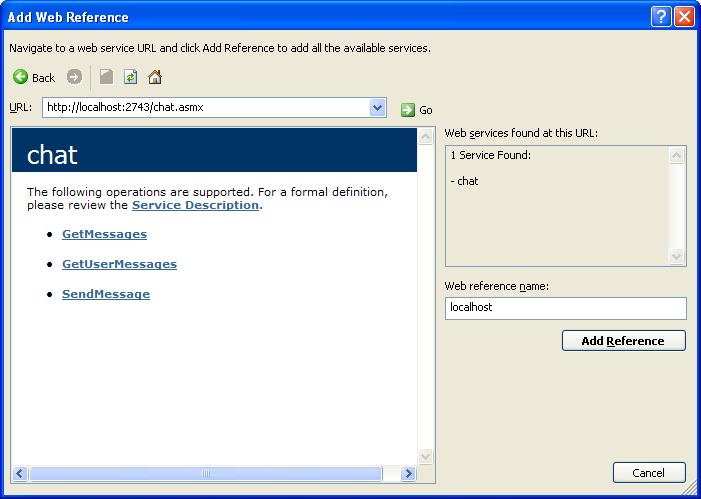 If we select the chat web service, we see the URL http://localhost:2743/chat.asmx - running using the local web host. This is a nice URL to test, but not the real deployment URL, of course. After deployment - and at the time of writing - the URL for the ASP.NET web chat service on my web server is as follows: http://www.bobswart.nl/webchat/chat.asmx. <%@ Page Language="Oxygene" AutoEventWireup="true" CodeBehind="Default.aspx.pas"
<asp:TextBox ID="tbChat" runat="server" TextMode="MultiLine" Rows="20"
<asp:Button ID="btnSendMessage" runat="server" Text="Send Message"
<asp:Button ID="btnGetNessages" runat="server" Text="Get Messages"
There are two event handlers that we need to define: for the btnSendMessage click (to send the contents of the tbName and tbMessage TextBox controls to the web service), and the btnGetMessages click (to retrieve all messages - for example the ones from the last 24 hours). First, we need to add the WebChat.nl.bobswart.www namespace to the uses clause, and then we can create an instance of the chat web service proxy before we call the SendMessage method. Retrieving the current contents of the chat room (i.e. all messages since yesterday) can be done by calling the GetMessages method, passing DateTime.Now.AddDays(-1) as start parameter. Note that it might be a good idea to call the GetMessages method right after the call to SendMessage in the btnSendMessage_Click event handler, to ensure that the user immediately sees his own message appear in the chatroom. A public version of this chatroom demo is now available on my server at http://www.bobswart.nl/webchat/. Feel free to leave messages and/or write your own client to this web service. Note that I will add security in the form of SOAP Headers in the next few weeks (a bit sooner if the chat room is attached by spammers ;-)). In this article, I've demonstrated how we can use Delphi Prism and ASP.NET to write a web chat service, consuming it in an ASP.NET web form as well. Next time, apart from SOAP Headers, I'll also add HTTPS support to the server to increase the secutiry of this otherwise public chatroom.